Advertisement developed to entice people in the Richmond, VA area to vacation on the Outer Banks. 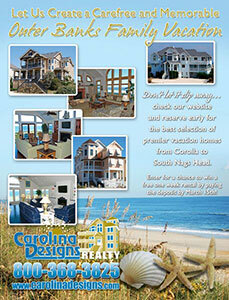 Carolina Designs is a premier vacation rental agency specializing in large, luxury rentals. The advertisement must display that premium quality of service, yet carefree like the perfect vacation.